I’ll be dreaming about this recipe for months. I have been searching for the recipe for years. I love the brisket. There are so many possibilities with this recipe. In the next couple of months you are going to see several recipes that I am testing to find the perfect brisket. This one could be THE ONE! When you make it you’re going to think it is just too easy to be good, but it is THAT good! I saw it on Smitten years ago and pulled it out when I was cleaning my freezer and lo and behold found a 6 lb brisket. I know that’s a lot of brisket but the two of us ate every bite and slurped every drop of broth wanting more. Now here is a recipe that you can put in the slow cooker a couple of days before Christmas and you can feed the hungry for many times. In fact you have to make this at least a day before serving it since it takes about 10 -12 hours to cook . A must do step is to store the meat separated from the broth. It will make it easy to skim the fat from the broth and you will be surprised at how little will be to skim. So get your cooking on for the holiday season with this brisket. It is as good as my favorite restaurants or better because you have all the control! Enjoy! I love recipes that require little effort, that you can pull the ingredients out of your pantry at a moment’s notice, and taste heavenly! This is the recipe. Easy, easy, easy and good, good, good! I cannot tell you one time that I have had pinto beans other than a Mexican restaurant. My mother always made black eyed peas, but no pintos or black beans. Well, now I have broadened my horizons or rather my tastebuds. 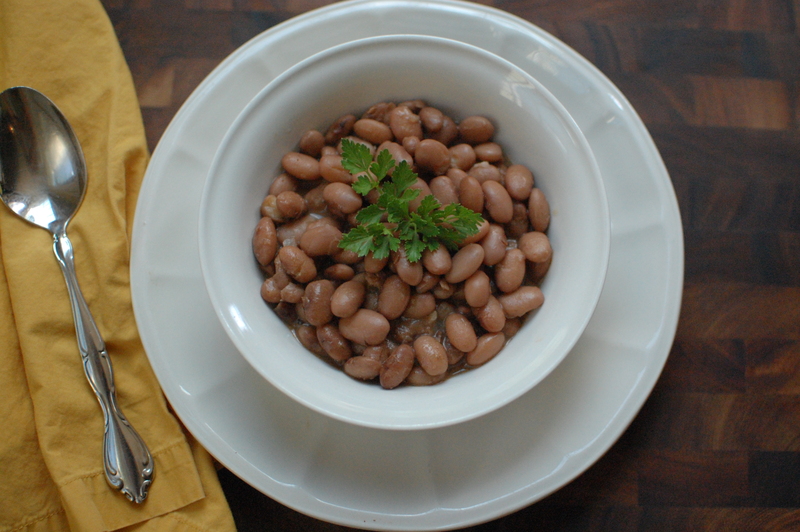 I love this recipe and have made it several times now and each time there is not one spoonful left and there are just two of us eating these beans. I made homemade cornbread, but also being the nutrition teacher that I am I sauteed spinach with a little olive oil, garlic, and red pepper flakes and topped it with a squeeze of fresh lemon juice. Oh, my gosh! This time of the year I am always trying to keep my life organized and stress free. That’s really funny. No it is next to impossible. Imagine trying to organize meals for two places at the same time and then doing all the grocery shopping, cooking, serving, and cleaning. It is enough to make the most organized person crazy. Here is a great recipe for times when you want a great meal, but are short on time. I love my slow cooker for certain foods and this is one of them. And another thing this recipe takes really no cooking skills at all. What could be better?